Like a rich blend of spices, the shops along Devon Avenue flavor your visit to Chicago with diverse sensations. Outside – the streetscape looks like a Midwestern commercial street from the 1920-50’s. 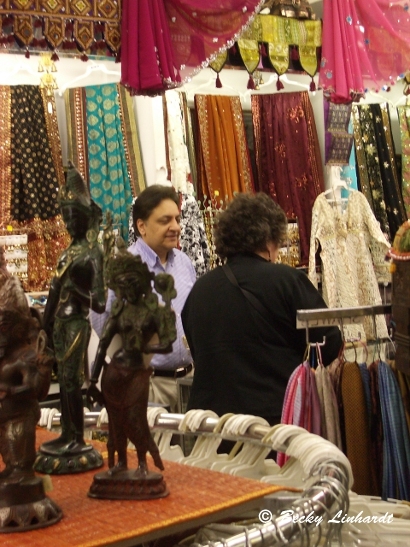 Ah, but inside the shops it is as if you have entered a merchant’s booth in a bazaar or souk in India or Pakistan. I loved going into Resham’s, a small shop that has goods packed to the ceiling and crowding the aisles – so much to see and feel. Down the street at Patel Brothers (now a regional grocery chain) the smells of exotic spices and the beautiful presentation of the fresh produce were tempting but I was traveling so bars of Sandalwood scented soaps satisfied. Sari shops offer beautiful traditional clothing but there are also shops that offer more modern styles of Indian clothing. And, since gold is an important investment for most Indian families, the jewelry stores specialize in delicately crafted gold necklaces, bracelets and rings. The neighborhood is diverse, home to Jewish, Korean, and other Asian restaurants and food markets. Devon Avenue is a destination for ethnic cuisine because of the authenticity of foods and flavors – no Americanization in the meals served here so be sure to ask about the heat/peppers in each Indian dish. Color – lots of color and all that glitters, gleams, and hints of long distance travel to exotic ports of call. The profusion of colors will remind you that you can surround yourself in a rainbow of bright red, orange, sapphire, amethyst or just accent with those colors. You can find pillow covers or embroidered table runners to drape over a table, sofa, or modify for use as a valance above sheer drapes. Use your imagination! Brass ornaments, mirrored fabrics, and some decorative accessories and wall hangings and even some accent furniture items can be found at Resham’s.